Photo credit: K. Theule/USFWS, CC BY 2.0. I live in a small house with a small garden in an urban neighborhood in Canada’s biggest city. I didn’t think that wild animals would factor into my expenses. But this spring I learned what it costs to evict a skunk. The first sign that I had an unwelcome tenant came soon after the snow melted. A hole was visible in the narrow ground between my garden shed and my neighbor’s fence. Probably a raccoon, I thought. In May, I glimpsed something black-and-white disappearing into the shrubbery. Then, one afternoon, I came face to face with the skunk while I was gardening. It ambled casually to its burrow under the shed, while I covered the 20 feet to my back door with far less nonchalance. In the following week, daytime encounters became more frequent, while the fragrance of eau-de-skunk drifted through my open windows at night. The skunk had me spooked. I was reluctant to go into the garden, imagining Pepé Le Pew lurking just out of sight, waiting to spray me. Googling “how to get rid of a skunk” led me to the Toronto Wildlife Centre. For skunks, it recommends being patient and waiting until the fall when they typically leave their dens. The next level of action is “humane harassment,” such as placing bright lights, vinegar-soaked rags and a radio tuned to a talk show near the burrow to encourage the skunks to find a less annoying place to live. But I wanted a more immediate solution. That required digging a 12” x 12” trench around the perimeter of the structure where the burrow is, and lining it with wire mesh that prevents skunks from digging. Then you install a one-way gate (basically a door that only swings out) in the burrow entrance to so that the skunk can’t get back in after it leaves. Then you hope the skunk wanders a long way off before making a new home, which can take one or two weeks. The Toronto Wildlife Centre recommends a particular company for skunk removal. I called them for an estimate. It would cost $395 to assess the site and install the one-way gate, and $15 per foot to install the mesh around the shed. (All dollars are Canadian.) This came with a one-year guarantee, and the earliest date they could do the work was about three weeks away. I researched other animal removal companies, while disregarding my family and friends’ suggestions of rat poison and broken glass. A company called Wildlife Shield provided an estimate that was the same price for the mesh but only $275 for the gate. They could do the job the following week, with a two-year warranty. I booked Wildlife Shield to do the work on May 31st and scheduled a vacation day so that I could be home for the appointment. The Wildlife Shield rep was friendly and worked quickly. In a few hours he secured my shed with a mesh-lined trench and installed a one-way gate. Only one large shrub and some allium bulbs were taken out in the process. Knowing that the dislodged skunk would be looking for a new home, I surveyed my property and found potential entry spots under my deck and porch. Locking those down required more wire mesh, a heavy-duty staple gun, and wire cutters, none of which I owned. In the next week, my nose could tell that the skunk was still hanging around. Then I noticed that a new hole had been dug under the one-way gate, which required another visit from Wildlife Shield to repair. Follow-up visits are included in their service fee — it’s like having them on retainer. I began to hope that the skunk had gone. Then, looking out my window one rainy afternoon, I spotted four small skunks hanging out like middle-schoolers at a mall. I called Wildlife Shield again. “It looks like mom has moved on and left the kids behind,” the rep said when he returned on June 8th. But if the original burrow was blocked, where were these youngsters living? As we inspected the area, one of the skunks popped out of a small hole next to the patio stones. Mystery solved. More digging was required (and a small hosta was sacrificed). The Wildlife Shield rep installed a one-way gate in the new burrow entrance. A new wait-and-see period began. 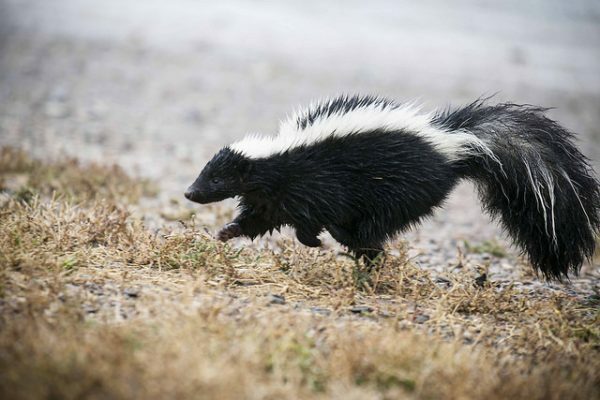 Wildlife Shield offers a “skunk deodorizer” service for $125. It wasn’t clear if this is something that removes skunk smells, or something that skunks don’t like to smell. I passed on the deodorizer, but I did buy jars of Critter Ridder animal repellent from the hardware store, hoping it would encourage the skunks to look for another place to live. Critter Ridder smells like dried orange peels and hot pepper. Sprinkling it around the burrow entrance felt like a superstitious ritual and I’m not sure if it made any difference. Wildlife Shield also suggested mixing cayenne pepper and hot water to spray as a deterrent. I needed to replenish my spice rack. Getting rid of skunks like getting rid of the hiccups. One day you realize you haven’t seen (or smelled) one in a while. Wildlife Shield has come by a few times to remove the one-way gates and check the site, and it seems like the skunks have moved on. As I write this, I’m sitting in my garden on a warm day in July, enjoying a breeze that carries only the scent of curry from the restaurant on the corner. Leigh Bowser works as a non-profit communications specialist in Toronto. She spends her summers defending her garden from wildlife, and her winters exploring outdoor skating rinks.